The Save South Africa campaign has become an increasingly relevant voice on behalf of civil society organisations campaigning for better healthcare, better education, and a real commitment to social and economic justice. At the heart of if its campaign, since its formation three months ago, is a call for the removal of President Jacob Zuma. Save South Africa convenor, SIPHO PITYANA, explains why Zuma’s removal is so important as a catalyst for real change. People often ask why the Save South Africa campaign has such a strong focus on removing President Jacob Zuma. The answer is simple: Dislodging Zuma will drive a broad process of reflection and discussion about the quality of new leadership, and begin the real drive to restore integrity. It will be a catalyst for a new beginning. We do not believe that removing Zuma is the silver bullet that puts an end to the rot. But it is the beginning of unravelling the corruption, reversing state capture, restoring the integrity of the state and embarking on a new trajectory – where we have responsible and responsive leaders, and where the interests of the people are put first. And when that has been achieved – whether in December this year, or sooner – Save South Africa and other civil society formations will be there, with a checklist for ethical leadership in hand, to ensure that the post-Zuma era, and the post-Zuma leadership, contains none of the horror stories of the era we are in now. To ensure that is avoided, it is worth reflecting on exactly what Zuma represents. Clearly, Zuma has no respect for the Constitution – and in fact, is its most dismissive critic. He disregards the courts and institutions of democracy such as Parliament and Chapter 9 institutions. He is the commander-in-chief of state corruption and brazenly and daringly drives the agenda for state capture. He has neither honour nor integrity. And he has absolutely no sense of accountability – in fact, he is a champion of impunity. His leadership is a disaster for the country – he has violated the relationship of trust between the state and the people. And it is critical that we ensure he is increasingly isolated from the ANC. As the Save South Africa campaign, we will therefore continue to highlight the damage he causes to the country and to the ANC. This may sound like we are conducting a negative campaign, but it is actually a positive one. We are placing a very strong emphasis on strengthening the foundations of our constitutional democracy and issues of accountability, and ensuring leadership accountability and integrity. We are contributing to a new future. We are promoting a sense of activism among ordinary people, and building institutional capacity for active citizenship at all levels of governance to ensure accountability of leadership. Most important, we are campaigning to ensure the country has leadership that makes decisions in the interest of the country. This means empowering South Africans to understand and use the powers they possess through the Constitution in pushing for accountability and honest use of public power and authority – with a specific focus on principles of leadership in the country. This means looking closely and campaigning around issues such as governance, integrity, constitutionalism, national values, restoring our international reputation and restoring the relationship of trust between the state and the people. A failure to address this, we believe, will result in increasing socio-political and economic instability, unrest and protest. It will also put an end to any hope of meaningful sustainable economic transformation. It will, in essence, be a disaster to make the same mistake twice. All this begs the question: what exactly is Save South Africa? Despite what you may hear from our detractors, we are a campaign, not an organisation. We have no political ambitions. Ours is a campaign to restore accountability, integrity and honour in leadership in line with the values of our constitutional democracy through active citizenship. We see ourselves as a counter-veiling force to those who are intent on undermining our constitutional democracy. In doing so, we are consistently focused on the leadership qualities that should make up our constitutional democracy. We believe we have already made a significant contribution to the isolation of Zuma, and that forces such as the ANC Stalwarts, the MK National Council and members of the ANC NEC, and the Alliance, have gathered strength from the support shown by civil society. We’ve created a legitimate and principled voice with moral authority – yet not oppositional. This programme of isolation will continue, and we will continue to mobilise civil society to force the ANC to realise that JZ is no longer Number One – he is the Number One Problem. We will also continue to highlight the damage that Zuma is causing to the ANC – not just to its reputation, but to its ability to meet its historical mission of bringing about social and economic justice. We believe we must make 2017 a year of change and hope, and make big steps towards the South Africa we all fought for, some died for, many sacrificed so much for, and many continue to work towards. One of the lessons we have learnt in our three months of activism is that there is a growing sense of common purpose among people involved in a range of struggles. The struggles of those campaigning for equal education coincide with those campaigning for better healthcare. Those campaigning against the pending nuclear deal have a lot in common with those campaigning against state capture and corruption. Those working for a non-sexist, non-racial society have a lot in common with those promoting civic activism. Our focus, therefore, will be a broader one this year. Zuma remains the focus – but our campaign list is being expanded to include other examples of his kleptocracy, as well as issues relating to economic justice, social justice, and human rights, that will be championed through our endorsing organisations. We believe this will not only bring in new voices, but will consolidate the energy and focus of those campaigning for a better South Africa. Ultimately, we are calling on all South Africans to claim their rights as citizens and stand against corruption, and to restore the integrity of the state. We are calling on citizens to find their voices again, to begin to craft the kind of South Africa we can be proud of, and to speak openly about the attributes we want in our leaders. This is an edited version of comments made by Sipho Pityana to a gathering of journalists in Johannesburg on January 31, 2017. 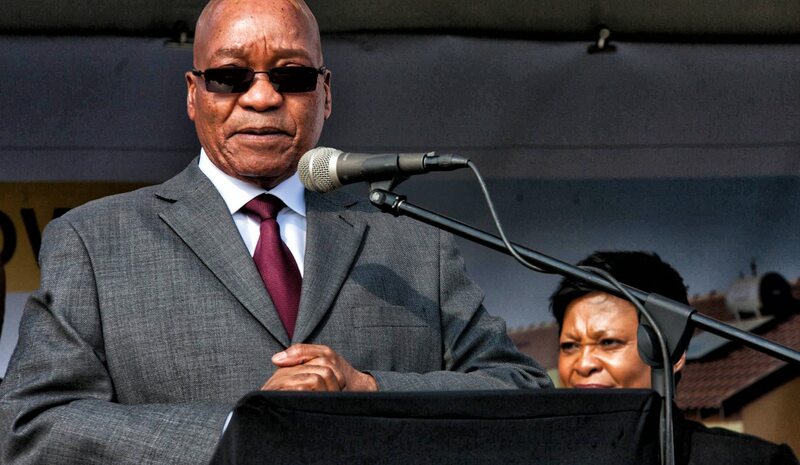 Photo of President Jacob Zuma by Greg Nicolson/Daily Maverick.